The Chevrolet Corvette is one of the coolest cars of all time. Imagine that classic image of the American astronaut navigating his ship through outer space and preparing for reentry, the front of the ship slowly glowing red as it enters Earth’s atmosphere, and the ship falling into the clouds, and then breaking through them into a clear sky headed for the desert below. We’ve seen the scene dozens of times. Now imagine that scene to the tune of “Radar Rider” by Riggs. No? Too obscure? Okay, now imagine it rotoscoped. No? Not sure what that is? Rotoscoping is an animation style where live action images are made into animation. 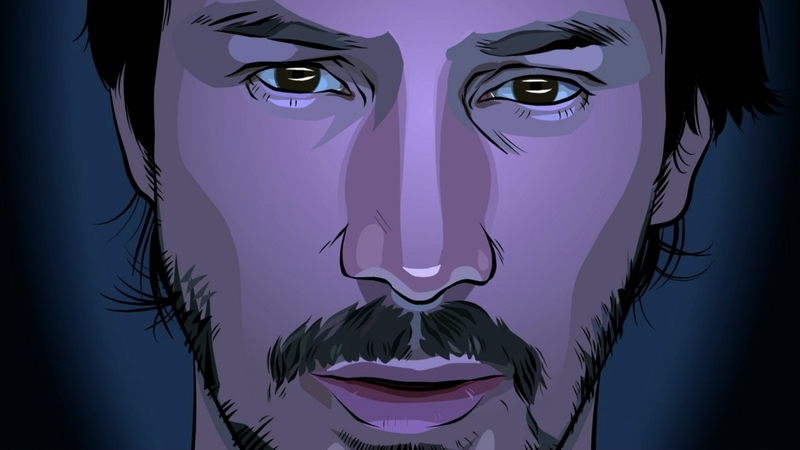 Think Richard Linklater’s Waking Life and A Scanner Darkly, but in its infancy. No? Nothing? A slightly newer Corvette with only 4,000 miles in Stuart, FL. Okay, let’s just make the space ship a late 50s Chevrolet Corvette. Yeah, someone did that. Now we have the opening to the animated science fiction and horror anthology Heavy Metal (1981) based on the amazing groundbreaking magazine by the same title. The movie starts with the space shuttle opening its bay doors, which for the movie are on the bottom, and from which a second ship is lowered into space, its dark undercarriage indefinable, and the interior lights of the bay glowing bright enough to obscure this secondary spaceship. The music kicks in, and the next shot we see is the helmeted head of an astronaut, a car steering wheel in hand, the windshield framing him and space opening up behind him—of course it’s a convertible, why wouldn’t it be? For purely aesthetic reasons of course and certainly not scientific ones. What we see next are actual animated photographs—incredibly stylized rotoscoping—of the late 50s Corvette, which has been argued to be a ’59 or a ’60. First, a close up of its beautiful toothy grill and shiny stand-alone headlights. And finally some nice long shots with its whitewall tires, red leather interior, and white body with a fat gray swoosh shooting out from its wheel well and along the front doors. As it reenters, Grimaldi, the astronaut, uses the wipers to flick away the accumulated burnt reentry skin on the windshield, which is probably the most scientifically accurate part of this sequence, but stretchingly so. The sequence, “Soft Landing,” was directed my Jimmy T. Murakami and John Bruno and written by Dan O’Bannon who had written a little horror sci-fi screenplay called Alien (1979) and who would go on to direct Return of the Living Dead (1985). The maiden voyage of the Space Shuttle was 1981, the same year the film was released, which can only mean that the nation was already so excited about these huge changes in the space program that even art was already influenced by it—finally, a spaceship with wings!—and yet the nation was still on a high from the NASA moon landing a mere twelve years before. They took the whole science fiction promise of a flying car, one-upped it, literally into space, and intertwined it forever with the idea of American progress. The opening sequence to Heavy Metal is more nationally iconographic than any war movie out there, and is in fact probably the most Americana-filled opening sequence in the history of world cinema.